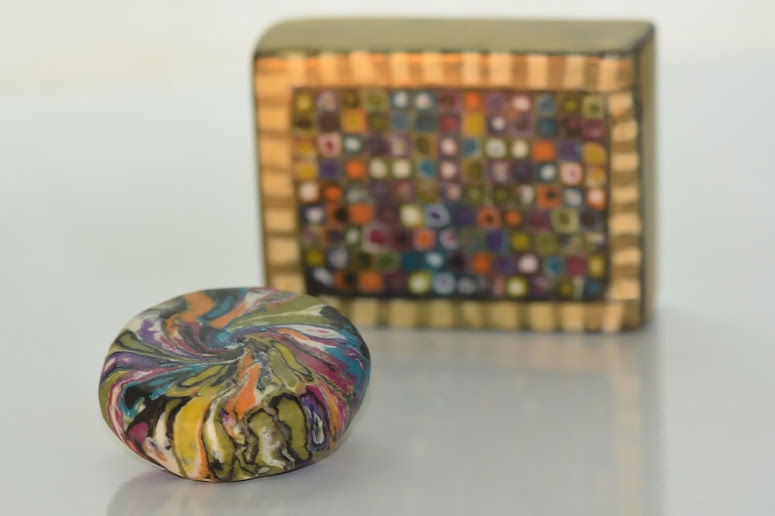 Soap City: D'Oh -- it's Klimt! 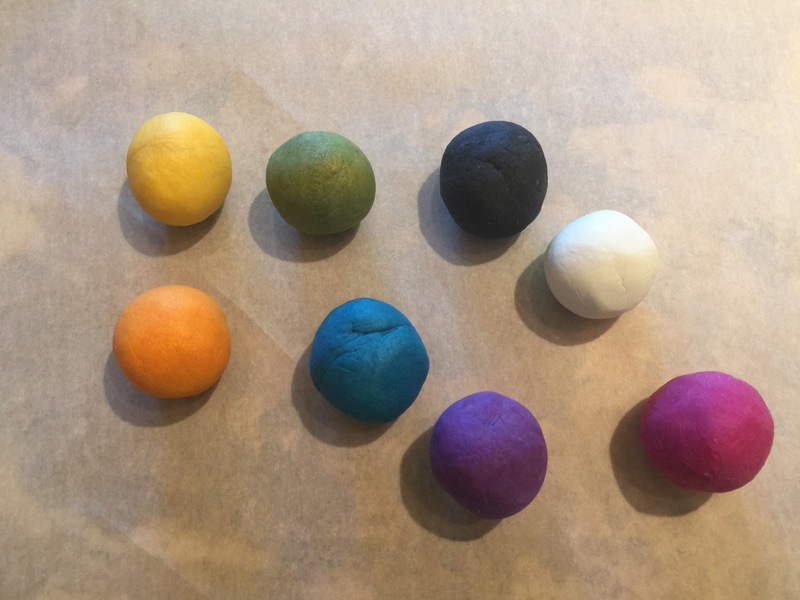 I was so happy when I learned we were doing soap dough for this challenge, as I've been hoping for a recipe/technique to get soap to behave more like polymer clay. And I really appreciated having Sorcery Soap's recipe, but as Bee points out: soap likes to stick to everything but itself -- which is the opposite of what is needed. The ever-amazing Tatsiana Serko has her own recipe/technique, which got me closer to what I was looking for. The trick is to make the dough into bars, like normal soap, then when you need some dough, you plane off the edges and use the insides. Brilliant! You don't strictly need to use alcohol, but I find that it makes the colors more vibrant than with just dry colorant. But I've found that the only way to get completely smooth and consistent colors with dough is to color before trace, otherwise, there will always be bits of traced, uncolored dough in there. If I were insane enough to do this again, I'd make little balls instead of discs, as it would go faster. Once I had my disks, I stacked them into a cheap polymer clay extruder, pushed the handle, and out came these messy-looking 3/8" noodles. 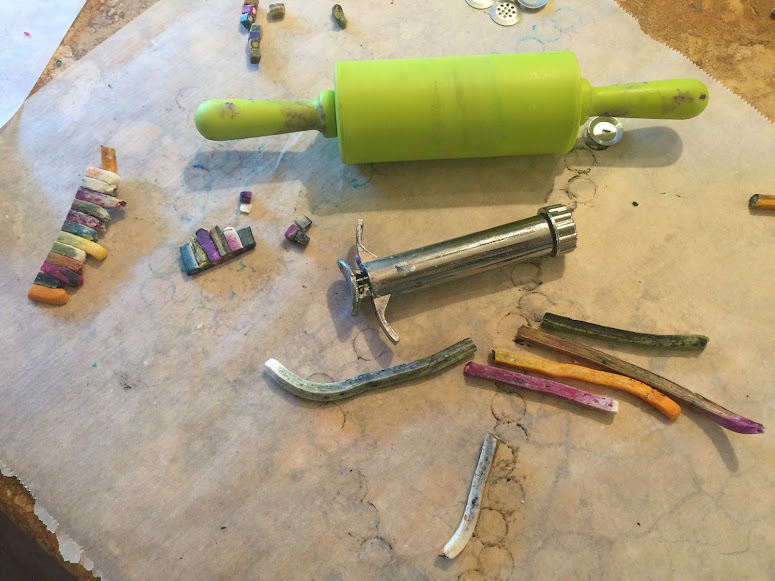 I didn't do a great job of capturing all the steps, so please see Lisa Pavelka's Extruded Mod Canes post of you want to know how it all works. Then, I layed them flat, squished them together and cut and stacked them. Any time a cane wouldn't stick to it's neighbor, I'd brush it with a tiny bit of water, and then it would stay. Of course they need gold mica, too! Wow! I love this! At first I thought that they were little tiles so I loved the surprise of seeing that each color block was a column! Thanks! Yeah, I really like it when the design goes all the way through the bar. OMG, this is so good, I still don't get how you got different colors inside each tube? Does the cutter do it automatically? Regardless, looks amazing, love this soap. Colors are great too. I added a link to a mod cane tutorial in the post, but basically, the colors just happen if you stack them right. Klimt is like my all time favorite, I even have fancy dishes that have his rose pattern around the edges. So, I love this bar! And so much detail, love it. I also love your pillow with a crown. So cute! I am sooooo jealous that you have Klimt dishes! Whoa, This is a unique work of art Claudia!!! Love your creativity, all the colors, the design it all just came together so nicely. This is so great!! I love that you were able to experiment with the recipe and come up with one of your own! 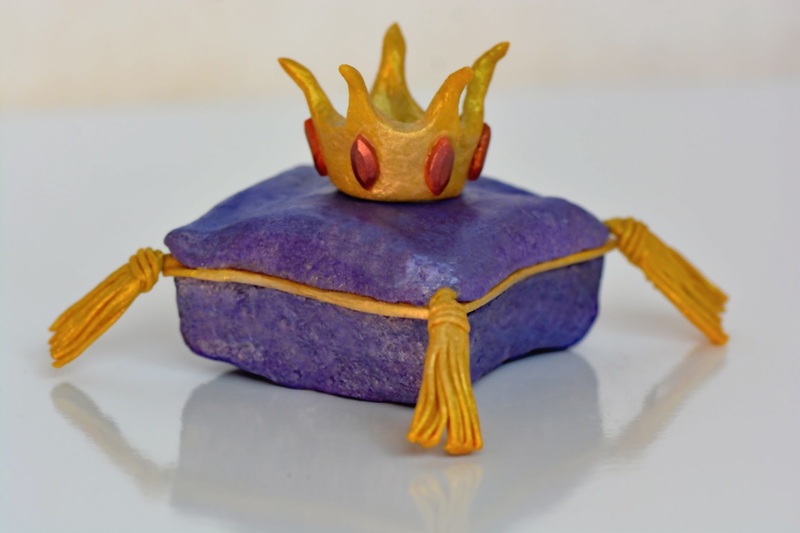 And that you were able to create something amazing with a polymer clay technique! Really, really fun to see how it all came together! Thanks, Amy -- it was really, really fun! 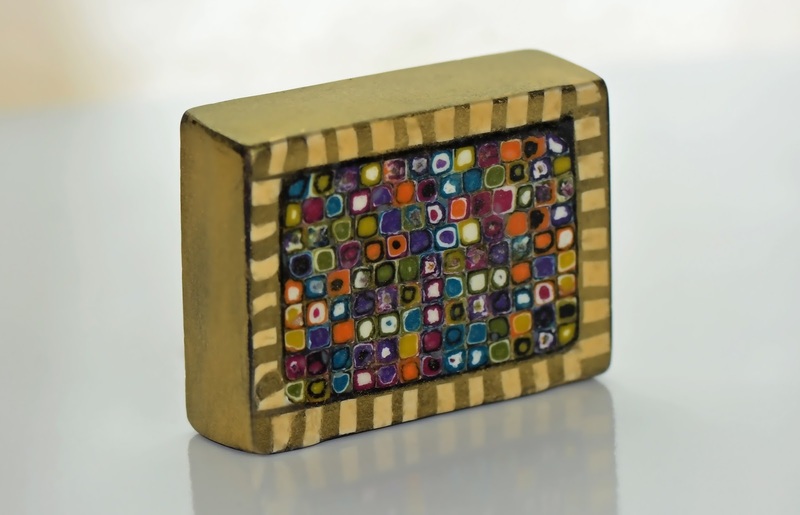 Claudia, I am shocked by so painstaking and labor-intensive work, a very beautiful soap. Good luck!!! Thank you, Maria. Yes, it took forever, but once I get an idea into my head, I must make it! OMG!! WOW!!! 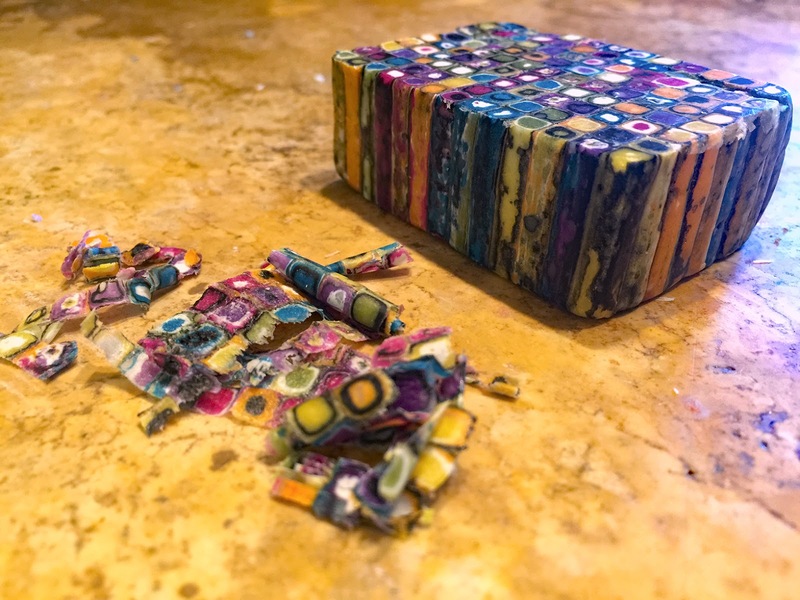 Such cool looking soaps - I would never have the patience and after all that work it would be hard to use the soap. I know -- you think I wouldn't use it after all that work, but it's been sitting in the dish next to the kitchen sink. I'm very interested to see how it holds up over time, and how this recipe makes my skin feel. The pattern looks so eye-catching and artistic, very stylish! What a great idea to stack the cane together.. I admire all your soaps!! How incredible creative! I am in awe!!! I just had to let you know how much I love this soap! I didn't find the time to enter this month, but I've been playing with making canes for a few years now, and this was very similar to what I was going to make if entered. The fact that soap doesn't stick to itself is exactly what I had run into. Could not get the canes to work. But, I am going to have to try it when I have time with all these new recipes :) I absolutely adore how yours came out!!! 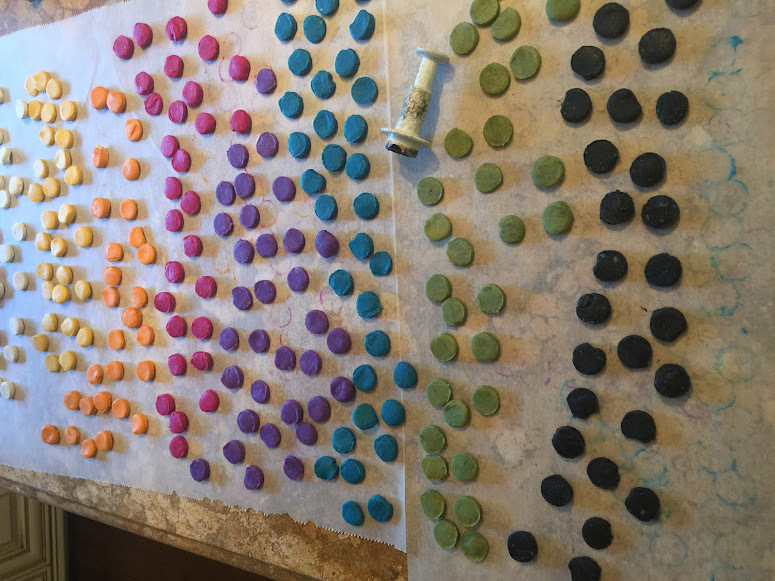 Although some of the bars people made were absolutely amazing, I wish more people had tried to make soap with all the polymer clay bead techniques that are out there instead of the play-doh creations, if you know what I mean. There are so many cool things to try! Thank you for sharing yours!!! Thanks, Taralyn. 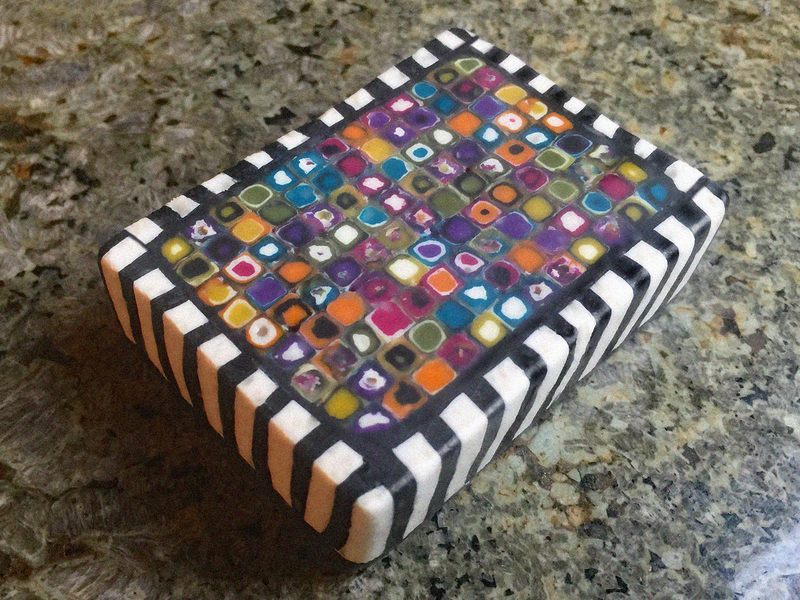 Yeah, I took it as a personal challenge to see if I could get soap dough to behave like polymer clay. It mostly worked, but I couldn't get oddly shaped canes to hold together well. I tried wrapping them in solid sheets of dough, but soap just doesn't have the same plasticity and tensile strength that polymer clay has. I am so fascinated with this technique right now, and I am determined to make it work. If I can, I'll share a pic of mine (if I'm successful). I'm so inspired by your success with the technique! I'm not sure I agree with you. You are absolutely one of the most artist people I "know" and the fact that you are also an engineering genius is amazing! I am so in love with the beauty of this creation. Knowing how much work went into it makes it even more phenomenal! And your little pillow is amazingly detailed as well! Brava my dear, brava!